The Trade Training Centre (TTC), located at Wirreanda Secondary School, was opened in 2012 and has enabled students to experience a far broader range of activities and courses than was possible prior to this time. It encompasses not only a very large undercover, air-conditioned work area with state-of-the-art machines and specialised tools (including a Table Saw; Plasma Cutter; Thicknesser; Cold Saw; a full welding workshop and a wet area for laying bricks), but a self-contained classroom in which students are grounded in the theory components of the courses that are offered. The Centre is located on the McArtney Street side of the school and is used by both Wirreanda Secondary School as well as ATEC, a Registered Training Organisation with whom we have a partnership. The school is currently offering the Doorways2Construction (D2C) Course in the TTC one day a week, delivered by a fully qualified member of staff. 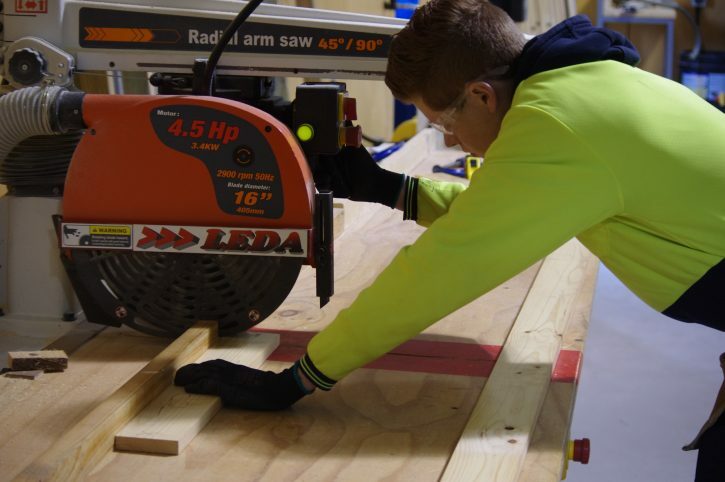 The students undertaking this course are predominantly in Year 11 and come not only from Wirreanda, but also from other schools that form the Southern Adelaide Fleurieu and Trade Schools (SAFTS) Alliance. ATEC is delivering Doorways2Construction Plus, which is an extension to the D2C Course, to students of the member schools of the SAFTS Alliance. In ensuring the delivery of these courses, Wirreanda is preparing our young people for a head start in the Construction Industry by giving them the chance to receive qualifications that are recognised Australia-wide. If you have any questions, please do not hesitate to contact Anne McKinlay, Wirreanda Secondary School’s VET Coordinator on 8329 7200.